At a recent signing event for our book, Food Lovers' Guide to Baltimore, we got into a conversation about bbq. One fellow lamented the diminishing size of a portion of ribs, saying full racks these days seem about as big as half racks in the past. We had to agree. Of course, talking about ribs worked up a hankerin' for them, so the next day we drove down to Howard County for what turned out to be a Festival of Meat celebration at Kloby's Smokehouse. While Andy Nelson's is more local and mighty tasty, Kloby's has far more variety, which we think makes it worth the drive. 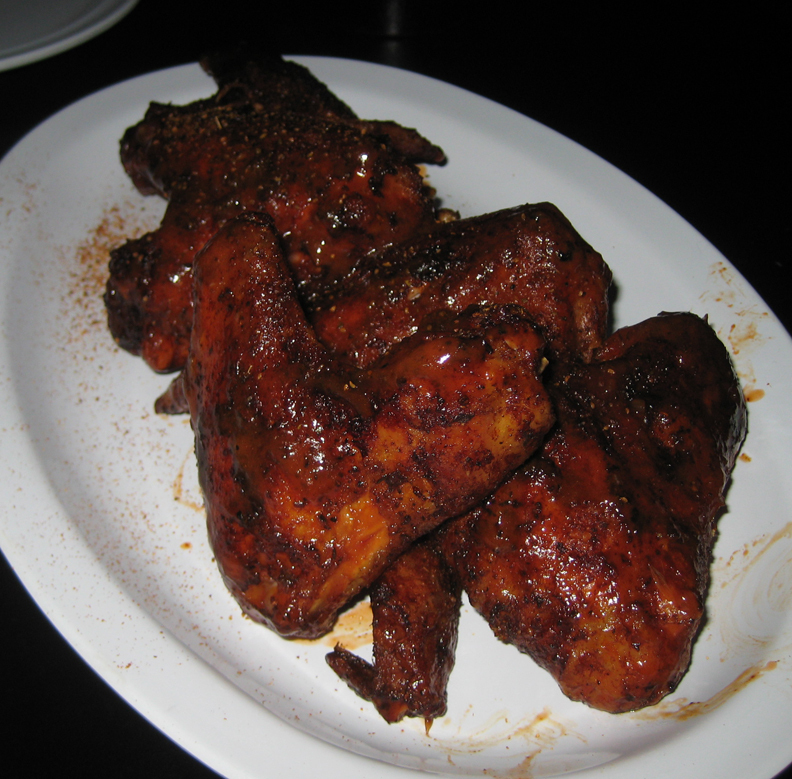 One of our favorite things there are the chicken wings, whole wings that are smoked before being fried and doused in the bbq sauce of your choice. Our favorite are "dirty and old," which are double fried and double tossed in a Buffalo bbq sauce and then dusted with a soupçon of Old Bay. They're super crispy, with meat that practically falls off the bone, and mildly spicy. They're also a bit messy, but well worth the extra napkins. We also tried the fried okra this time, which comes with a dip of Kloby's "Bama Pearl" bbq sauce, a mayo-based concoction flavored with horseradish and other seasonings. 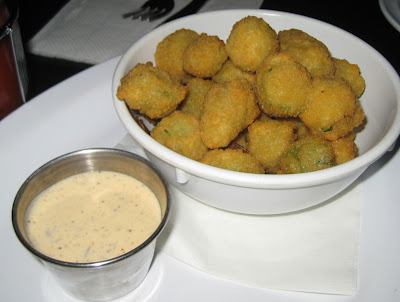 The okra was tender and creamy, but the coating was uninteresting and not unlike that on a commercial onion ring. Since ribs were what we came for, ribs were what we ordered (among other things). St Louis-style ribs (bigger than baby backs) were available on this particular evening, so Mr Minx ordered a full rack, hoping there would be enough meat to take some home. And indeed, it was a nicely-sized slab of ribs that merited a large doggy bag. They were not quite fall-off-the-bone tender, but didn't require all that much work to eat. 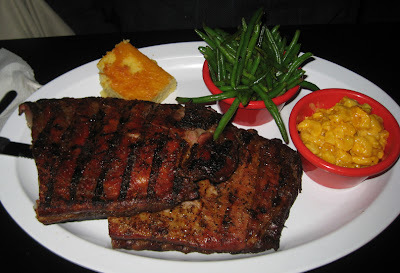 The smoky, dry-rubbed, meat was perfect eaten as is, without the application of any of the three Kloby's house sauces our server brought to the table. Those sauces - Carolina, Chipotle, and House - were good, in a tomatoey way, and not too sweet. The peppery Carolina was our favorite, but we didn't feel the need to use any of them. I couldn't decide whether I wanted beef or pork, so I ordered the 2-Meat platter with beef brisket and pulled pork. For $15, I got at least a pound of meat, and after putting away three wings earlier, I could only finish a couple of forks-full. The brisket was fatty and luscious, as was the pork; the latter had a bit of sweetness from being tossed with a modicum of sauce. Both were really delicious, with a melt-in-the-mouth texture. 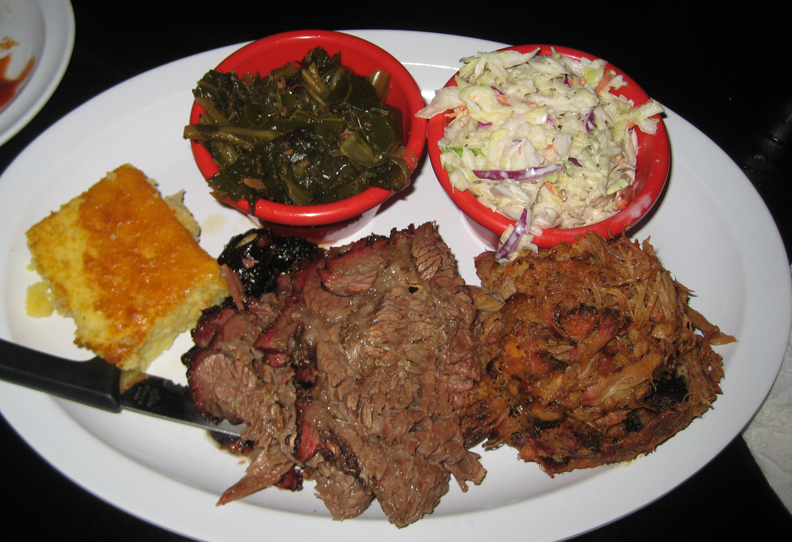 Our sides were all pretty good, too, although my collards and cole slaw both needed a hit from the salt shaker. Mr Minx's green beans were perfectly cooked, still a bit crunchy but not at all squeaky, and his mac and cheese was a gooey classic. Cornbread was too-sweet Yankee-style, so I ate mine last, like dessert. Kloby's sells all of their meaty goodness by the pound, too, and their prices are at least a couple of dollars cheaper than Nelson's, so that also might make it worth a drive down to Laurel to check out their wares. Especially those wings.